Alert! Taylor Swift has been spotted at a recording studio. With Swifties everywhere buzzing about a possible new album, the superstar "End Game" singer might've just dropped another hint about her next chapter. While nothing has been officially announced, Swift was just spotted at recording studio in New York City. Photos show the 29-year-old donning a skirt, black leggings, oxfords and coat, with her hair pulled back in a scrunchie, exiting the studio on Thursday evening. "It appeared she was there all day as she was not spotted leaving until after 9 p.m.," a source tells E! News, noting that Swift looked "pretty focused" as she left the studio holding her phone and her purse. The insider adds that it looked like Swift "had a pretty intense full day of recording." Swift has been dropping clues about her next chapter in recent months. 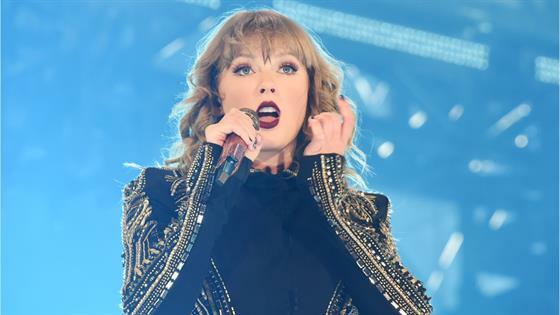 When she took the stage at October's 2018 AMAs, where she won multiple awards, T.Swift gave fans hope for what's to come. "I always look at albums as chapters in my life. And I'm so—to the fans, I'm so happy that you like this one," Swift said of her reputation era. "I'm so happy that this means that you like this one. But I have to be really honest with you about something, I'm even more excited about the next chapter." Earlier this month, Swift had her fans in a frenzy over her New Year's Eve costume, thinking it had something to do with a new album. Swift hosted a star-studded New Year's Eve bash at her place in NYC with celeb guests Gigi Hadid, Blake Lively and Ryan Reynolds. For the occasion, Swift told her Instagram followers, the group decided to dress up as their childhood heroes. "Mary Poppins, Audrey, Ariel, Ms. Frizzle, Cinderella, Gwen, Mr. Toad, Avril, Nancy Drew, Posh Spice, Rizzo, Frida Kahlo, Steve Irwin, Dorothy.. This new year we decided to dress up as our childhood heroes," Swift, who dressed as Ariel from The Little Mermaid, wrote to her fans. "Sending you all love and hope going into 2019." Though Swift's NYE post seemed innocent, many fans believed her costume was a hint at TS7's theme: mermaids. One savvy social media user, who spotted Swift wearing mermaids on multiple occasions during her reputation era, tweeted, "IS !!! TAYLOR?!! ALREADY??? GIVING US ??!!! TS7 CLUES?!! OMFG THE MERMAIDS IS TS7 THEME IM-????" And now that Swift has been spotted at a recording studio, let's just say Swifties are even more excited for what's (hopefully!) to come. "The fact that @taylorswift13 was leaving the recording studio has me SHAKINGGGG," one Twitter user wrote. We'll have to wait to get a confirmation from T.Swift herself on this delicate subject!